Not that I need incentive to knit, but the weather sure helps. After one warm weekend, when many of the students on campus ended up with sunburns, it’s turned cold, windy and snowy again. No accumulation, but I sure don’t want to work in the garden again—although there are daffodils blooming out there and I can see my miniature roses coming back to life. So, on my needles right now (in the snow!) are my Annetrelac socks (one finished and then frogged back to the heel because it’s too fat, and the second one almost ready for toe shaping). I love the way the colors come out on this Noro sock yarn, but would not buy it again. 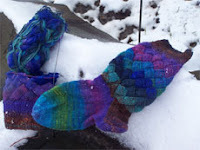 I’m one of “those” who want both socks to match and the Noro, lovely as it is, is not consistent in the single ball that’s large enough for two socks. I did some fudging to get as close as I could, but the two heels are different colors and there’s a greenish color in the leg of one sock that doesn’t show up in the second sock until the foot. But I also started a pair of Fair Isle socks in alpaca. I’m modifying a pattern from Interweave Press’ book Sock. The pattern is in a sport weight and #5s. The alpaca I’m using is close to lace weight and I’m using #2 circulars, so I’ll need to extend/modify the patterning on the leg. I’m also playing in my mind with using multicolor quilting thread as a strengthener once I get to the heel and foot! That will be a work in progress from sometime. Last Friday I got a call from my granddaughter (and my son). 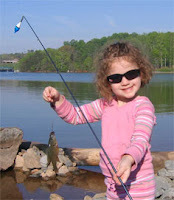 They live in Knoxville, Tennessee, but Ellie told me about how she caught her first fish! She will be four years old this June—I don’t get to see her enough. I hope that this summer, she will get to visit us out west in Idaho. I know Ellie will love the alpacas and chickens and dogs and the pond at Big Meadow Creek Alpacas. Maybe she can catch a fish there.Both my children are in the east—my daughter is currently in New Orleans, providing support for the people still recovering from last year’s devastation. I hope to be able to visit her sometime this year.